A number of different instruments can be used to determine height. With the exception of the Merritt hypsometer, all work on the same principle of taking two slope readings. The scales in each instrument are just housed in a different setting. Electronic hypsometers (or “lasers”) are very easy to use, and are becoming the standard instrument for measuring trees in most areas. They come with a variety of different complexities and capabilities, but essentially, they work the same as a clinometer. 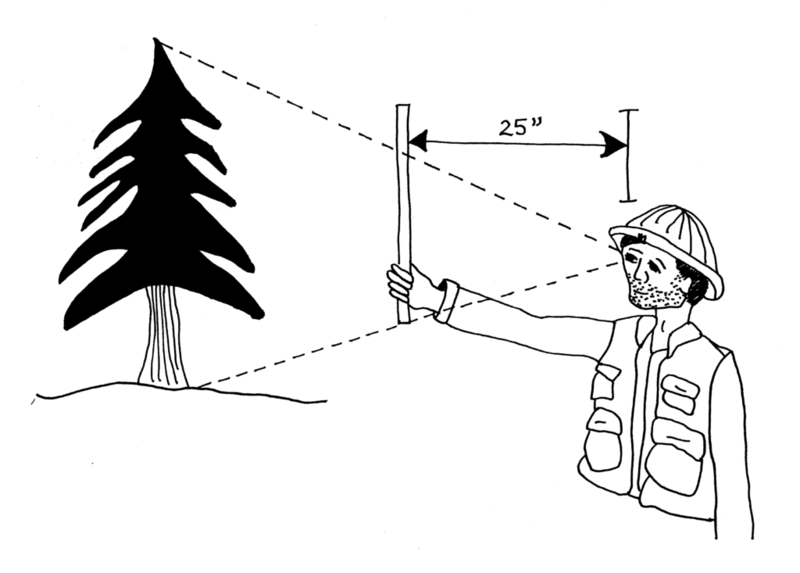 Typically, the following steps are taken to measure tree height. A built-in laser rangefinder determines the horizontal distance to the tree. Readings are taken at the top and bottom of each tree as with a clinometer. A button is pushed to calculate the tree height. This built-in calculator makes the math simple and allows much more flexibility in choosing a place from which to measure. As long as the tree is clearly visible, it is easy to measure it from nearly any distance. A laser can improve measuring efficiency in most situations. There is no need to drag a tape through the brush, which speeds up measuring tremendously. Also, because of the easy calculations, it is possible to “point and shoot” a number of trees from a single spot, if they are all clearly visible. Note: one still has to be far enough away from the tree to see the top clearly, just as with any other instrument. The laser is not foolproof however. Perhaps the most frequent errors result from faulty horizontal distance measurements. If this measurement is wrong, then the resulting tree height calculations will be wrong. The laser will calculate horizontal distance to whatever the laser beam hits first. For example, if a branch is hanging 15 feet in front of the tree, and the laser takes its reading on the branch, the horizontal distance measurement will be 15 feet too short, thus underestimating the tree’s height. Each manufacturer has ways to deal with possible errors, so it is important to become familiar with the equipment being used. Secondly, although the instrument may calculate tree height to several decimal places, that kind of precision is not realistic, so tree height should still be reported to the nearest foot. Though not commonly used, the Merritt hypsometer on a Biltmore stick is an inexpensive tool for estimating tree height. It is based on the principle of similar triangles (Figure 2.15). Figure 2.15. A Merritt hypsometer on a Biltmore stick is held 25” from the eye to measure tree height. The technician stands at a standard horizontal distance from the tree. Closing one eye, the technician places the bottom of the stick at stump level. Tree height is read off the stick where the tree top crosses the stick. In most cases, purchased Biltmore sticks are marked with “logs” instead of feet, but it is easy to construct a stick with a variety of units and better precision.